Not sure what to brew next. I have it narrowed down to an American Pale Ale or an Indian Dark Ale or a Belgium Witbier. Any votes? What to brew next? Indian Dark Ale or APA or Belgium Wit? Belgium Witbier! Can I vote more than once? Or does my vote weigh more then these APA/IDA lovers? 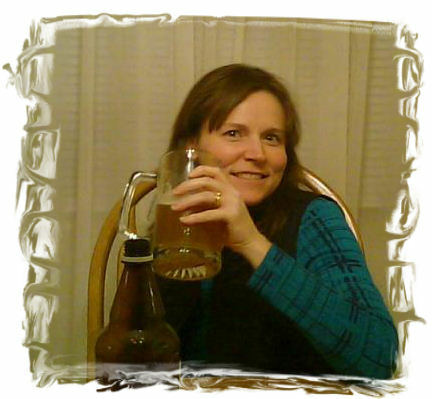 Well, as you may already know, I am married to the Beer Model. You may also know that I'm an extremely whipped husband. She is much hotter than I am, and she has a real easy time influencing me. So, it probably doesn't come as much of a surprise that Whisky Wife Wit won despite the fact that it got the least number of votes. As it turned out, it got the only vote that counted. I suppose next time, I'll just ask her what she wants me to brew. I might have to ask for special permission to brew anything real hoppy or dark. Not sure she'll ever let me brew my IDA as it is both hoppy AND dark. When it comes down to it, though, I posted the question because I wanted to brew all three of those beers and I don't have a 3-sided coin (or enough fermenters available to do all three). None of those other voters are going to help me drink the beer (I'm sure they would be willing, but they all live outside the SheppyBrew distribution area). It might as well be the Beer Model who decides. It you've never had Whisky Wife Wit (previously known as Whisky Wife Wheat II), it is a lot like Blue Moon's Belgium White. I think it has a slightly smoother / creamy and fuller bodied mouth feel which really works well with the the orange flavor. It might have a slightly more authentic "Belgium" spicy phenolic character than Blue Moon, but it is still pretty restrained compared to lots of Belgium wits I've had. It has what I would consider the perfect amount of "Belgium" in it. 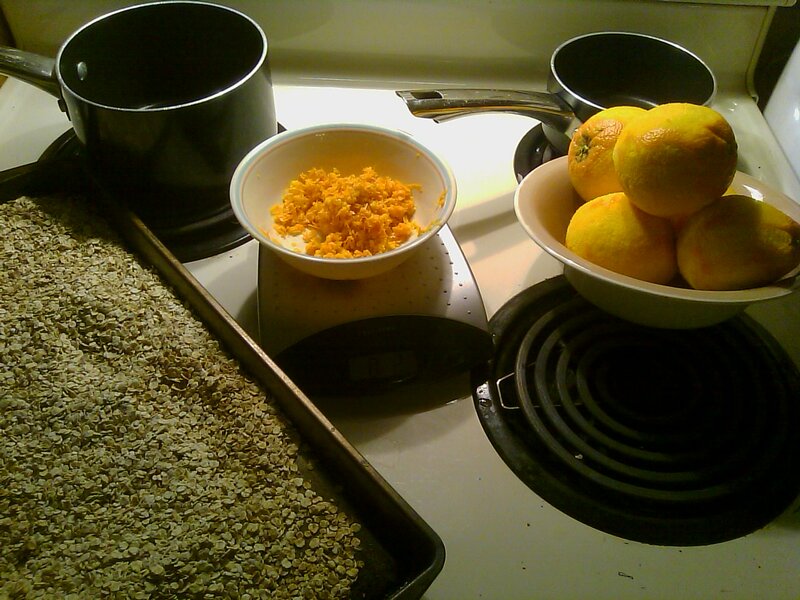 This, along with the oat and wheat flavors combines with the orange and coriander for a nice complexity. I find that every sip I take will bring out a slightly different flavor to my attention. It really is a nice beer IMHO. Apparently the Beer Model likes it too (at the very least she likes it more than APA's or IDA's). Part of the reason WWW was on the list is because I've had some Belgian Witbier yeast (Wyeast 3944) harvested from when I brewed my last series of wits. I think it has been in my fridge since last May. This is longer than most will suggest that you store harvested yeast. I was not completely sure it would still be viable. So, I have been building it up with a series of starters. It did get real active replicating and fermenting in the starters, so I think it will work fine. If you followed the link above to the recipe, you may have noticed that I am doing this as a partial mash rather than all all-grain. The main reason is that between the flaked oats and the high percentage of wheat, I am a bit concerned about a stuck mash with my usual process. By doing a partial mash in a grain bag and "steeping" the bag containing the mash rather than a traditional sparge, I don't have to worry about that possibility. Someday, I'm sure I'll do all-grain mashes with wheat and / or oats, but just not this time. I had to get up early on the brew day to purchase the oats and oranges. I used the King Sooper brand quick oats and got 6 (used 5) navel oranges. This time, I "toasted" the oats just at 325 in the oven for about 15 minutes on 2 cookie sheets. Palmer had suggested that on one of his Brew Strong shows and also in a BYO magazine article. The zest came to 2 1/8 oz on my scale. I called it good enough. My recipe said to use .79oz of coriander. It turns out I only had 5/8oz, so I called that good enough as well. That actually seems like a bunch of coriander, so I am really hoping that I didn't make a mistake documenting the amount last time I made this. RDWHAHB, right? And then, my partial mash started out sort of badly. The original strike water was the perfect temp (sort of rare in my process), but did not seem nearly enough. The mash was a paste and the temp was way down below 140. I quickly heated up about a gallon of what was going to be my sparge water and dumped that in. The mash temp magically went to 154 (I got lucky there). I guess you could say I did my first (unintentional) step mash. See my new(ish) 8 gallon pot? My water volume was a bit high. So was my OG into the kettle. I think maybe my little kitchen scale is not as accurate as it used to be. But, it isn't big enough a difference to get worked up about. The boil went as usual. I only did a 60 minute boil this time since it was not all grain. The first hop addition went in at the 50 minute mark. The only other addition was right at flame out. 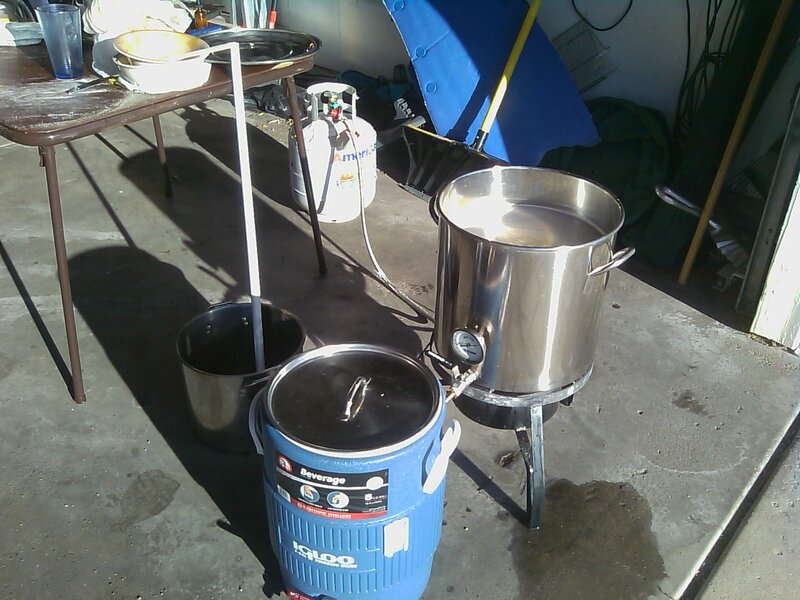 One thing I have to address is getting a wort chiller for my 8 gallon pot. The ice bath is not as efficient at the larger volume of water. Plus, it is almost my birthday, and that will make a great toy (if no one gets it for me). My OG was high (1.058 compared to recipe 1.050) as well. Part of it is not being used to the bigger pot. The fact that my scale might be having me add too much LME might be an issue too. Well, I'm ok with a higher alcohol beer. The orange aroma from the pot was great. I'm looking forward to drinking and sharing this with my beautiful Beer Model. I might even share with others. By the way... I created a RSS Feed for the SheppyBrew website this weekend. If you would like to subscribe to updates, the feed is: http://www.sheppybrew.com/rss/RSSHandler.ashx . I am using twitterfeed to automatically tweet whenever I make an update to a page or if a comment is made on one of the pages. Yes, I'm a geek. Connor was doing this weird dance today. I guess he learned it at school. I have always put two spaces at the end of my typed sentences. I know for sure that my typing teacher in high school told me to double space after every sentence, and I've always done as she taught. Apparently, a single space is correct, and I have been doing it wrong. "Shep, you are completely wrong for putting two spaces after your periods. Man, you're an idiot!" I paraphrased there. You can read it yourself if you want a more complete understanding of the article. I didn't believe Farhad Majoo, but I checked a couple of books and magazines. I looked at his references, and I googled the subject. Apparently, he is right. I have been wrong all these years. I am an idiot, just like he said. I also went and checked a bunch of blogs. Apparently, most bloggers know the rule, because the majority of the blogs that I checked seem to be following the correct format. It was just barely a majority in my admittedly limited poll of blogs. It was indeed a majority none-the-less. "As a practical matter, however, there is nothing wrong with using two spaces after concluding punctuation marks unless an instructor or editor requests that you do otherwise." So, Farhad's claim that I'm an idiot is a bit harsh, and you might even say unfair. Elizabeth says that she is trying to change. I'm not going to. I refuse to. Maybe when I eliminate all my other imperfections, I'll work on the correct end-of-sentence spacing, but until then, I'm not going to worry about it. Just for the record, though, if you say "your" when you really mean "you're", I still think that you are (you're) an idiot. I did indeed brew more beer. A much higher percentage of my beers had no Mr. Beer ingredients. All my batches were formulated from my own little mind. I did get help from various sources, but all were in the end, my own. I have done a bunch of All-Grain batches. The last time I did Buckwheat's BPA, I did a split batch that almost counts as a 5 gallon batch. I do not really know, and it is not worth it to figure it out. I'm not even sure what I meant by "dark" beers when I typed that. More people did drink SheppyBrew beers, although probably not by as much as I had planned. I did give away quite a few 6-packs as gifts this year. I'm not sure what to say about 2011 expectations. I think I'll brew about the same amount or maybe even less. I'm thinking that I'll concentrate more on my favorites and thus have a bit less variety as well. I may or may not let more people try my beers. Part depends on who comes and visits the brewery and part of it depends on what my inventory looks like. I think most of my beers will be all-grain, but I will certainly do some of each of my recipe types. I probably will do real 5 gallon batches. Even if I don't get a 5-gallon fermenter, there will probably be more big batches split into two Mr. Beer fermenters. I may experiment more with different yeasts and/or dry hops in these split batches. I would love to get into kegging my beers, but I do not know if that will happen. Ok, I guess I'd better get going. A few weeks ago, I mentioned in Beer Ads that Boston Brewing Company (Sam Adams) is actually on the verge of technically being too big to fall under the definition of craft brewery. The Brewers Association has just decided to change the definition of "small" from under 2 million barrels to 6 million barrels. I guess Sam Adams, New Belgium, and Sierra Nevada are safe for awhile. In case you were wondering, the SheppyBrew Brewery was not even in danger of exceeding the 2 million barrel limit. I got to almost 2.5 barrels of beer in 2010 leaving me a bit more than 1,999,997.5 barrels short of the 2 million limit. It is good to have that extra buffer for 2011. I mentioned in Sheppy's X-Mas Eve that I did some work on the SheppyBrew.com website to prevent spamming in the comments. It is working. For awhile after I posted the code change, the spammers appeared to stop even trying. I continue to track the potential spam comments. I just don't "publish" them until I manually look at them and decide if it should or should not appear on the site. For some reason, today the spam-bots seem to be trying again for the first time since Christmas. Apparently these bots are not smart enough to figure out that it is not working. Another thing that is sort of dumb is that the vast majority of spam attempts are on a page that is not linked from anywhere, so even if the spam-bots succeeded in posting comments, no one would be able to see them except me. I don't need viagra, levitra, or cialis. Honestly, I don't. I'm starting to accumulate IP addresses of my known comment spammers. Today, all the spam attempts have come from the same address. Pretty soon I will do something to known spam IP addresses. If for some reason, your IP address is incorrectly flagged and you are unable to leave comments on the sight, leave me a quick message from the email form and I'll try to figure out what to do about your situation.